Near Shanghai, the Songjiang district has become a popular weekend destination for many tourists with its natural beauty and sprawling landscapes. 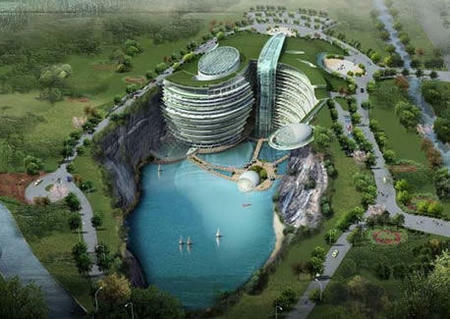 And now the Songjiang Hotel might just become the newest and greenest attraction. While it may look a bit sci-fi, this hotel was designed for the real (green) world, with many sustainable features in mind. This proposed hotel was designed by the firm Atkins, the same firm which has brought us buildings such as Tianjin’s Pile of Boxes and the Bahrain World Trade Center. The 400-bed resort will be located in a 100-meter-deep quarry located in the province and will contain restaurants, cafes, sport facilities, and even underwater public areas and guestrooms. Water will play an important part in the design, featured in many areas around the hotel. Waterfalls, underwater aquariums, and green areas will be integrated into the design to match the existing facing of the quarry. The reuse of an already existing site means that the environmental impact will hopefully be smaller. The entire hotel is to be covered in a green roof, while the building will use geothermal energy for it’s electrical supply and heating. The quarry will also provide a good source of heat control and shelter from the environment. The design of the building is meant to reflect the natural landscape of the quarry. “We drew our inspiration from the quarry setting itself, adopting the image of a green hill cascading down the natural rock face as a series of terraced landscaped hanging gardens.” said Martin Jochman. Needless to say, with such a cool looking site, you’d expect to get a design which will take advantages of it’s very extreme location, and you’d be correct. 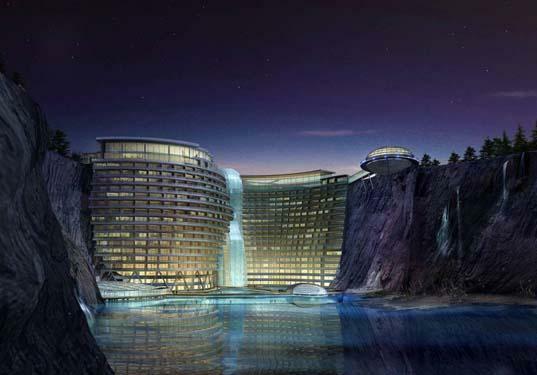 The hotel, will feature amongst other things: bungee jumping. The article states that there is going to be a later article with an interview between the author and Atkins Design. Now if China would just put more green roofs on buildings! How ridiculous and unrealistic is the man who is astonished at anything that happens in life. Any tragedy during Pakistan continues to worsen mainly because relief equipment and facilitate fall far in need of what is desirable. More facilitate is anxiously needed when the potential for many fatalities starts out to loom.